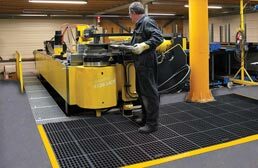 At RubberFlooringInc we offer a wide variety of industrial mats. 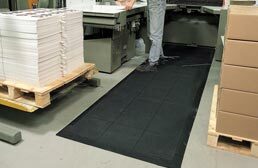 Our industrial floor mats for anti-fatigue are our most popular mats. 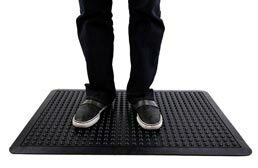 These mats help to alleviate the stresses of standing for long periods of time. 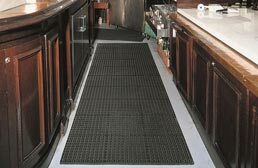 Great for factories, department stores, and kitchens, these mats are very durable and slip resistant. 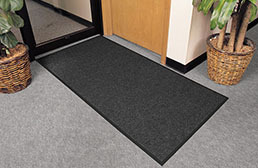 Our commercial door mats are available in indoor and outdoor mats. 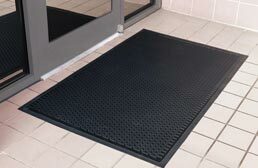 These commercial floor mats help to keep your floor clean of dirt, grime, and water. 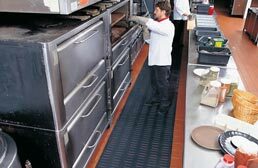 Our kitchen safety mats help to prevent slips and fall in commercial kitchens. 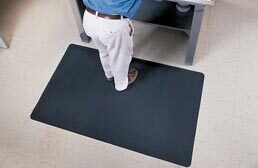 These mats are resistant to grease and oil and provide added comfort underfoot. 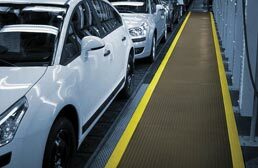 RubberFlooringInc we offer a wide range of industrial mats great for all type of uses. 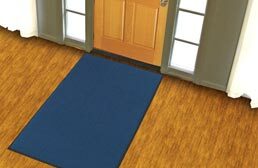 From anti-fatigue mats to entrance mats, we are certain to have the perfect mat for you. 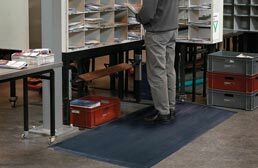 Anti-Fatigue mats are one of the most common mat used in commercial environments. 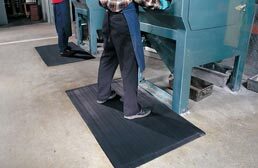 From retail stores to factories, anti-fatigue mats are a key component to making businesses a success. 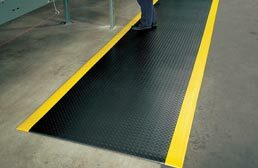 At RubberFlooringInc, we offer a wide range of industrial anti-fatigue mats in several colors, patterns and sizes. 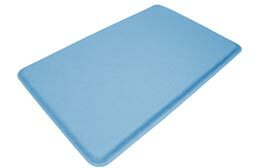 Our anti-fatigue mats come in rubber, foam, gel or a combo of materials. 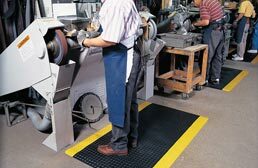 All of our industrial anti-fatigue mats provide comfort underfoot while standing for long periods of time. 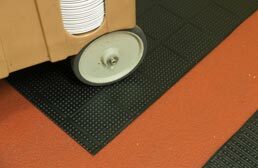 For areas where moisture may be an issue, we recommend using our rubber or rubber topped industrial mats. 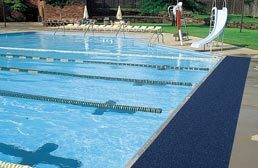 Rubber when wet is more slip resistant, which is very important in a commercial environment. Safety is paramount and no one wants a workman’s comp. case or lawsuit because someone slipped and busted their head. 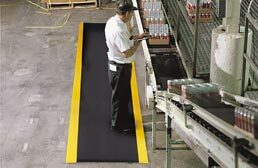 All of our industrial anti-fatigue mats are very easy to clean and maintain with a broom, hose or mop. 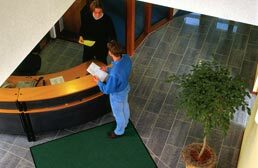 Our commercial grade entrance mats are constructed with the highest quality materials. 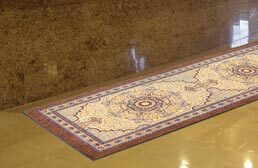 These mats are great for both indoor and outdoor use and help to remove excess dirt, water and grime from shoes. 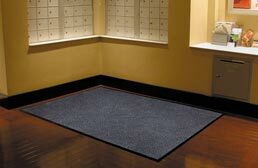 Entrance mats are crucial in protecting your floor from the outside elements. No one wants to create ‘Disney On Ice’ at the front of their business! 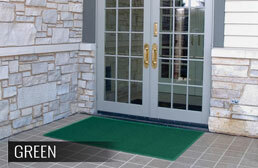 Our outdoor entrance mats are made of rubber. Rubber is a very durable material that can stand up to the elements. 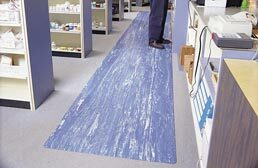 It is also more slip resistant when wet, which helps to eliminate a slip hazard in front of your business. 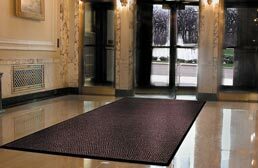 Most of our indoor entrance mats are made with yarn. Yarn is a very durable material and is very good at collecting water, dirt and grime off of shoes. 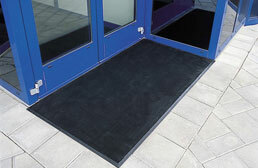 All of our industrial entrance mats feature a rubber backing which helps keep the mats in place. Our outdoor industrial mats can be cleaned with a hose or broom, while our indoor commercial mats are cleaned with a broom or vacuum. 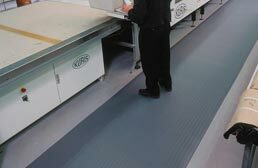 In most commercial kitchens, quarry tile or concrete is the required floor. 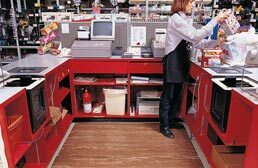 As anyone who has worked in a kitchen knows, these flooring surfaces are like hot lava on your feet after a long day’s work. 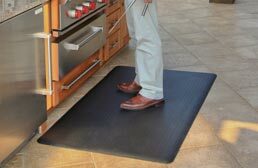 To help alleviate some of the pressure of standing on a hard surface like tile or concrete, kitchen anti-fatigue mats were created. 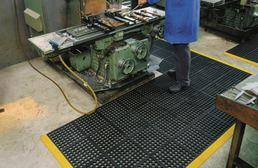 Our industrial kitchen mats come in two colors and in a number of patterns. 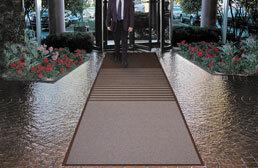 One main feature you will see with these mats is that they are all porous. 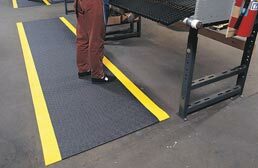 Featuring holes of various sizes, these mats allow water to pass through to drains which in turn helps keep the mat slip resistant. 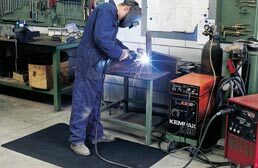 All of our industrial kitchen mats are resistant to grease and oils and are very easy to clean and maintain. With a hose and broom, your industrial mat will look brand new.